If rumors in Hollywood are true, the man who directed Sin City might be helming the movie about Marvel's Merc With A Mouth. Deadpool, like several other characters created by Rob Liefeld in the 90s, has managed to go from stupid and annoying to bizarre and awesome thanks to several talented writers and artists at Marvel Comics. His appearance in last year's Wolverine film was painful for some comic fans, but was popular enough for Fox to greenlight a movie based on the character. Now, based on rumors coming out of Hollywood, it looks like Robert Rodriguez might be the man to direct the picture. "Now there's word that Rodriguez has been offered a job directing the Deadpool film, which Fox has been actively developing since X-Men Origins: Wolverine opened last year." If Rodriguez does wind up directing the movie, this could be a home run that no one really expected. The script is being written by Zombieland scribes Rhett Rheese and Paul Wernick (if you haven't seen that film, shame on you), which seems like the perfect team to capture Wade Wilson's psychotic-yet-endearing humor; the film's producer confirmed that the movie will not only be faithful to the Deadpool comics, but the character will be regularly breaking the fourth wall; and Ryan Reynolds seems like an actor who might be up to the task of playing the character as faithfully as possible. Though Rodriguez's kid-friendly movies tend to make me nauseous, the man is more than capable of directing great action films. From Dusk 'till Dawn, Desperado, and Sin City are all movies that I proudly own. It may seem a little presumptuous to get one's hopes up for a movie that hasn't even left pre-production, but Marvel's last few movies have been more fun to watch than most other films I've seen in the theater. 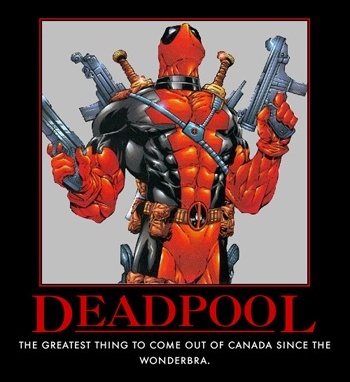 That said, it sounds like Deadpool could be a blast when it finally comes out.